How to recover ALL files from a corrupted hard drive? I have been using TestDisk and PhotoRec the last couple of days, and I am pleased to say they have been working very well the last couple of days! 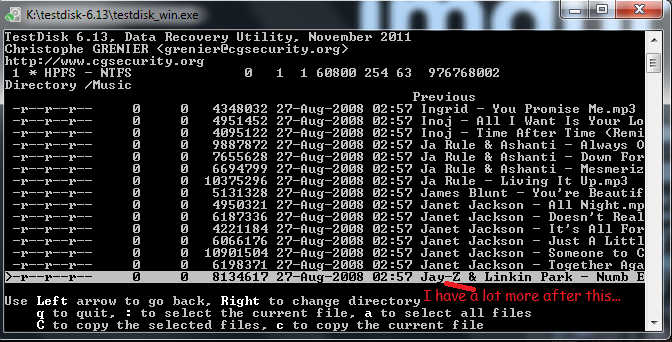 However, when I run TestDisk and list the files of a folder, it does not list all of the files in my corrupted hard drive; for example, in my music folder, I only have artists that start with the letter "A" and finish with the letter "J." Similarly, in my collection of anime, I can only see the first 80 or so episodes. I have tried pressing right and down on my arrow keys to search for more files, but it does not do anything. Additionally, I pressed "a" to select all files then "C" to copy them, but it is still copying only the files that are displayed. In short, how can I display all of the files in that folder? Re: How to recover ALL files from a corrupted hard drive? Can you repeat your diagnose using testdisk6.14WIP-32bit? Would it be possible that your checked line is a folder? It's not listed as folder or directory but a file. Would it be possible to copy as a test? Standard path is your testdisk folder. Would be for a test ok.
Changing directories you need only to check that two dots and press enter. To move into any folder you can use your right arrow key. I have repeated the same procedure with TestDisk 6.14, but the results are the same. I do not know how to "copy as a test"; what do you mean by that? In short, I have a lot of files in different folders that I wish to copy, but TestDisk does not display all of the files in the folder. I can only copy and paste some of the files, e.g., the first few hundred files in alphabetical order, but that's it. If there is a way to copy a folder, I am thinking that may make a difference. Also, I think this is the only method with TestDisk to recover my files because when I "Rebuild BS" it says "Extrapolated boot sector and current boot sector are identical." I also have the option to "Dump" the sector, but I am not sure what that does. When I "Repair MFT" an error message saying "Can't read NTFS MFT" appears, so I'm effectively left with listing the files and copying them (which I don't mind). Thank you for the help thus far. It means that your file system is damaged. Did you scroll through your files only using your arrow and page up and down keys? I do not know how to "copy as a test"; what do you mean by that? Your testdisk photo displays only files. r-r-r means, it's only a file (attributes of a file). To choose a folder in testdisk at the left side you'd see something like dr-xr for directory. So there is a file called JAY-Z & Linkin Park. The question is, should that be a file or a folder? For recovery it's necessary to determine the status of your file system. Yes, I went through my files on the hard drive with arrow keys. To answer your question, the "Jay-Z & Linkin Park" that you see in the screenshot is a file. My problem is that there are more files after it in that folder (titled "Music") that I do not know how to access.